Issue #452 of Doctor Who Magazine bids farewell to Amy and Rory as it previews their final TV adventures with exclusive new photos from The Power of Three and The Angels Take Manhattan. ...and two covers to choose from! "It's New York! One of my favourite cities in the world. And I love this script, and the Weeping Angels are my favourite monster, so it's all sort of come together for me on this one." "Remember Me" � DWM catches up with new Doctor Who regular Jenna-Louise Coleman and chats to her about playing Oswin Oswald and the adventures she'll be starring in next year. Surprise Surprise! - Showrunner Steven Moffat reveals all about Jenna-Louise Coleman's surprise appearance in Asylum of the Daleks and just why and how the secret was kept. The Memory Cheats? - DWM concludes The Trial of John-Nathan Turner, as expert witnesses Steven Moffat, Phil Collinson, Nicola Bryant, Andrew Cartmel, Paul Cornell, brand manager Edward Russell, and Big Finish producer David Richardson give their final verdict on the most controversial producer in Doctor Who's history. Tinker, Tailor, Soldier, Doctor - The Doctor, Amy, and Rory become embroiled in the shady world of international espionage and encounter an extra-dimensional horror in the second part of comic-strip adventure The Broken Man, written by Scott Gray and illustrated by Martin Geraghty. Daleks, Cybermen, and Sontarans! - It was the series that had it all: the 1985 run, starring Colin Baker as the Sixth Doctor and Nicola Bryant as Peri, which featured the Doctor's greatest adversaries! 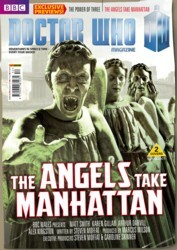 DWM takes a nostalgic look at Season 22 as Countdown To 50 continues. Hothouse of Horrors! �� The Fact of Fiction scrutinises the 1976 Fourth Doctor and Sarah adventure The Seeds of Doom and discovers that there's far more to the terrifying tale of horrible horticulture than meets the eye. Team Spirit � The past comes back to haunt The Time Team as they watch the Tenth Doctor and Rose meet Torchwood and confront the deadly Cybermen posing as an Army of Ghosts. And what will Chris, Emma, Will, and Michael make of the episode's dramatic cliffhanger? Science and Scares � Is Doctor Who at its best when it concentrates on telling horror stories? Or are its science-fiction tales better? It's monsters versus spaceships as Toby Hadoke and Johnny Candon go head to head to argue the pros and cons in A Battle of Wits. That's An Oeuf! � The enigmatic Watcher champions another supporting artist, challenges readers with his Six Faces of Delusion, and celebrates Oswin's eggs. Prepare to have your brains scrambled by Wotcha! In addition, the magazine - talks to Craig Charles, Chris Barrie, and Robert Llewellyn about the return of cult sci-fi comedy Red Dwarf to UK TV screens in October.